Many of you, dear readers, have asked me to show you what I have hidden in my kitchen cabinets. Last week, I revealed my organized, command central, desk area HERE in the kitchen. To see my entire kitchen remodel, go HERE. One of my biggest wishes for my new kitchen was to have a coffee station that I could leave open for my family, but hide away when company comes over, or when I was just sick of looking at the appliances. I scoured the internet for ideas and saw things I liked... you can see my idea board on my Kitchen Pinterest Page. I love using my pink Dualit toaster, microwave, and blender (if you want a perfectly smooth margarita, this is your gal), but I was sick and tired of them sitting on my counter taking up precious space. To fix this, I sketched out some ideas for my carpenter. We worked and reworked this area until we got it just right. The oven depth is 24 inches, but this walkway is the entrance into the kitchen from the mudroom, pantry, half bath, garage, pool side of the house. I wanted at least 4 feet of space between the barstools and the cabinet. 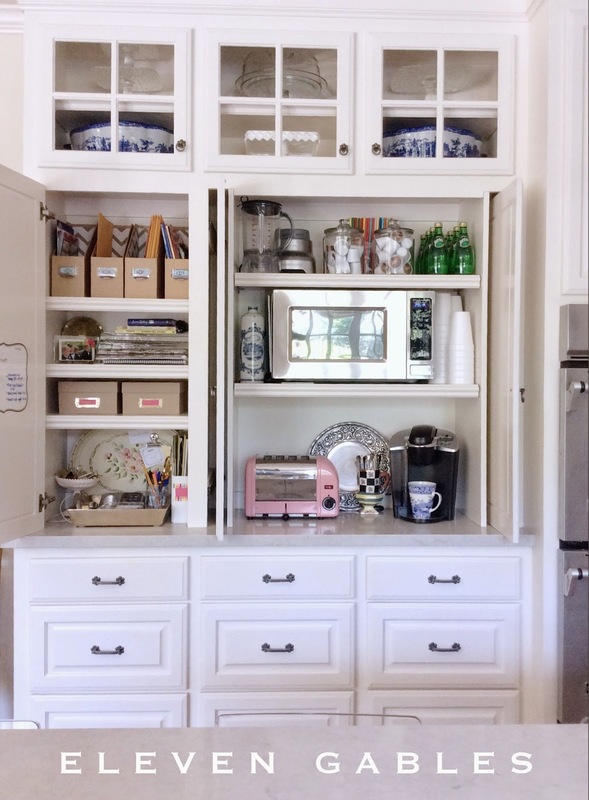 To achieve this, we dropped the lower cabinet back from the oven cabinet 4 inches so that the lower drawers were 20 inches deep. The upper cabinet is 16 inches deep. The countertop is Caesarstone to match the rest of the cabinets and backsplash in the kitchen. The middle doors are pocket doors. These gave my sweet carpenter a fit, but they are FABULOUS!!! I'm sorry Mr. C, I know you spent hours getting them just right for me. There is a tiny gap on purpose, but I was willing to live with that in order to achieve the functionality of the cabinet. Here it is! Opened by my sweet husband every morning before work, he has the coffee pot hot and ready for me! He grabs a "to-go" cup for his coffee, but I prefer mine in a Spode mug! Here, you can see the desk area next to my hidden appliance cabinet. This wall is so functional in my kitchen. It is full of goodness, all tucked away behind closed doors! I wasn't sure how I would like having my microwave behind the doors and on the opposite wall of my work area, but it hasn't bothered me one bit! I actually am glad it is out of site. One less thing I must wipe the fingerprints off of constantly! The toaster is a favorite among my boys. They can work it easily and it is right at their fingertips. I like to keep a cup of spoons next to my Keurig for stirring my coffee. 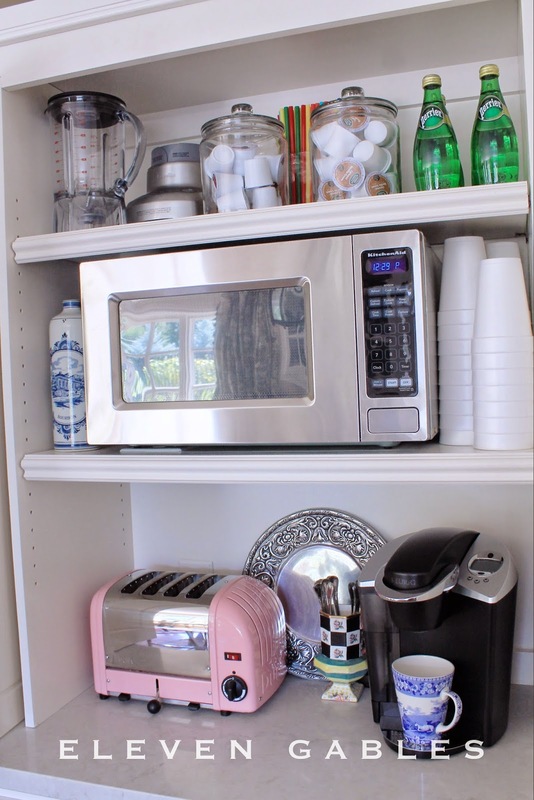 Extra coffee, straws, water, and the blender are stored on the top shelf. The big boys are just tall enough to work the microwave with ease. All of the shelves are adjustable in case I want to move things around someday. I love to share my resources with my readers; affiliate links are used. So smart!! 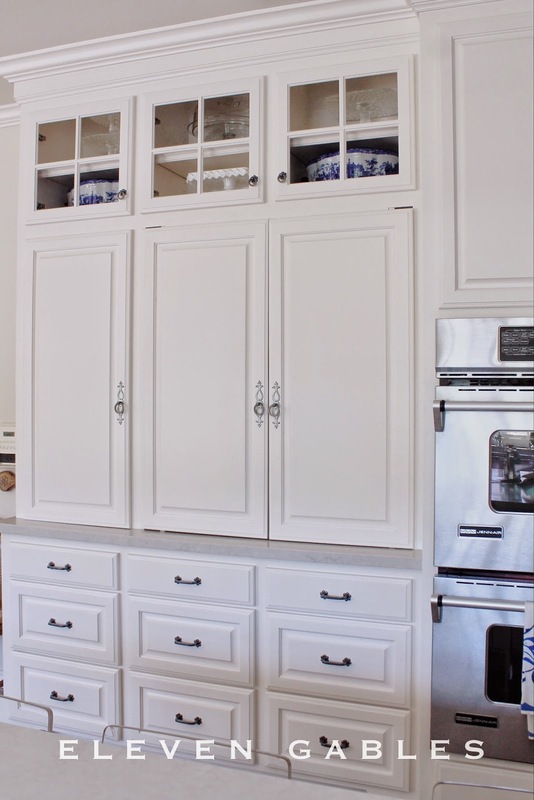 I have an appliance cabinet too but not with pocket doors and I am REALLY wishing it did have pocket doors now! Is there a trick to installing pocket doors for this cabinet? I love the idea but I'd love for the doors to be out of the way while working. Thanks! so amazing, every inch planned out.. I love it! What a great use of space!! I have a couple cabinets I may try reworking to get some things off the counter. 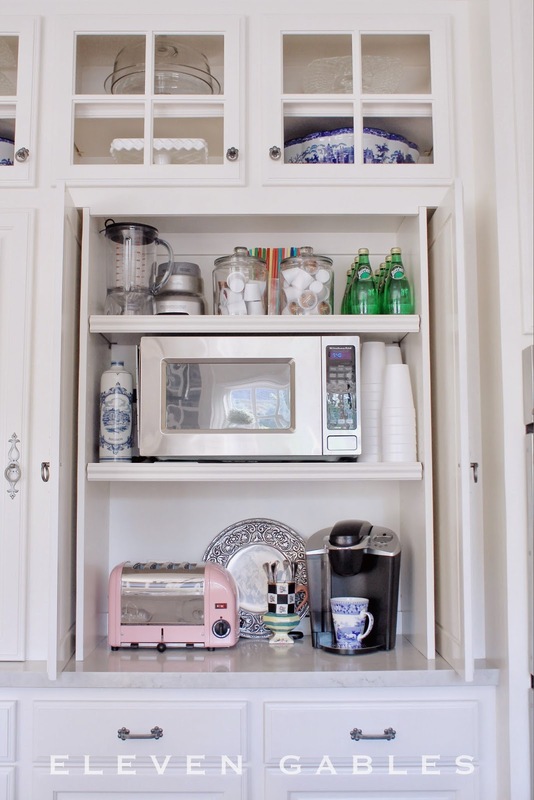 I love a cabinet like that! It's great to be able to close the doors and not see all the appliances...your kitchen is beautiful! Martina, you are too sweet. Thank you! 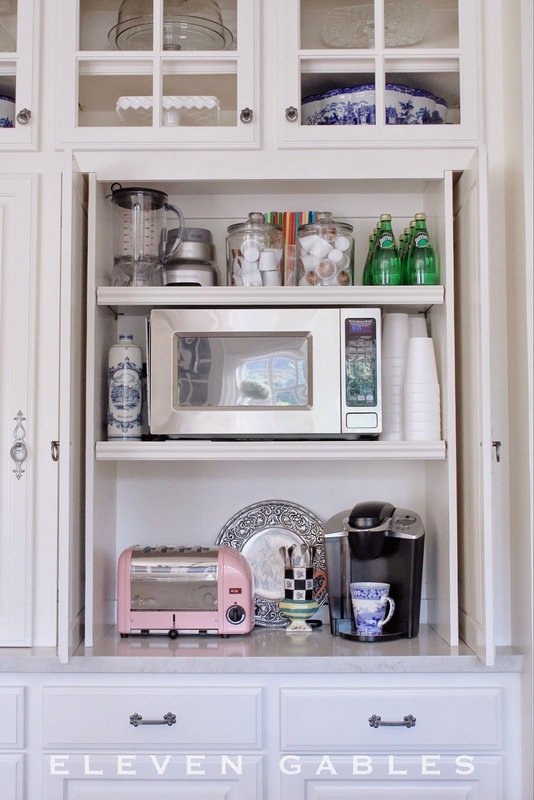 so pretty and so organized and i love the pink toaster! i am not hiding pretty things like that in my cabinets. Wow, what a beautifully designed space! Even though everything is neatly arranged, it so nice to make it all go away by closing the door. I wish I had the space to do the very same thing. I'm a fan of white furniture, especially in the kitchen. I really like your furniture. I have to admit that you had a good idea to group your items in cabinets. Regards. Pocket doors are a godsend! 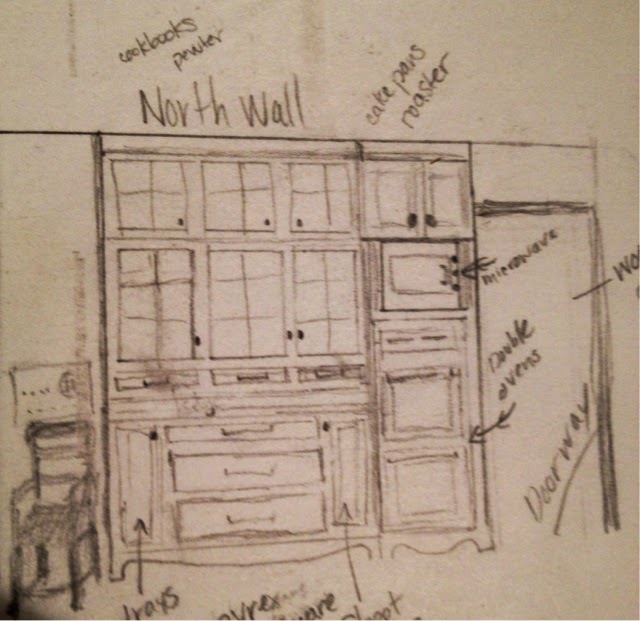 When we designed our kitchen, we used them for a similar function, except for the pantry instead of a command center. 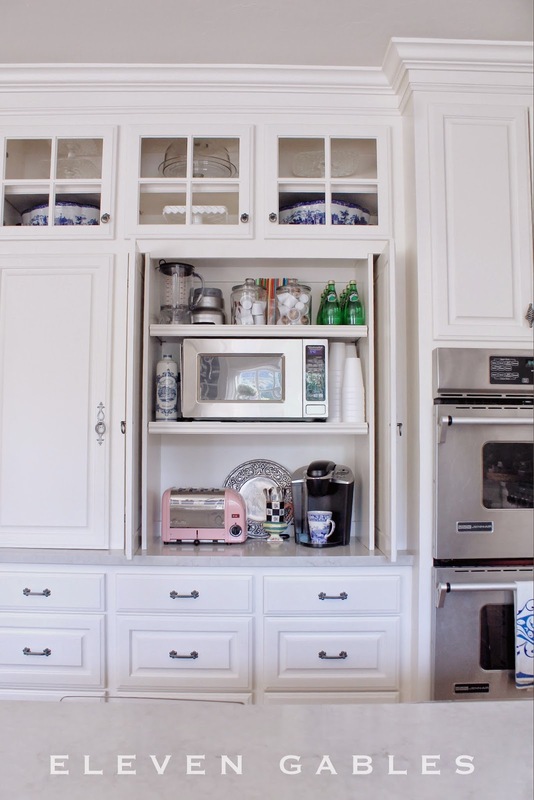 It helps keep the kitchen uncluttered even while you’re working, but still gives the clean look of traditional cabinet doors, a real win-win situation. Hi! How tall are the dividers above the island? Are you happy with the height or would your provide a alternate recommendation?